Namaskar, and welcome to this episode of the Master Builders of India – the ordinary men and women who created extraordinary monuments. Whether they were masons, stonecutters, inlayers, or simple labourer, their toil and hard work of months and years, manifested itself in the creation of mankind’s deepest quests – for love, for divinity, for ultimate beauty, for knowledge and for power and glory. Apart from creating magnificent monuments, these simple men had within them the power to tame the Nature, to transform wilderness into a piece of art. The landscape became the canvass for their creative genius. Man has always strived to improve the surroundings of his habitat by aesthetic and utilitarian integration of natural or cultivated elements with his constructions. The landscape has thus become an integral part of architecture. The landscape architecture was formerly called landscape gardening and was limited to the creation of gardens around the public or private buildings. However, in its wider connotation it refers to the science and art of integrating topographical features such as hills, valleys, rivers and pond; modifying land areas by growing trees, shrubbery, grass and flowers; and finally constructing buildings, terraces, pavilions, pathways, bridges, fountains and statuary. The aim is to establish a harmonious balance between the creation of man and that of the Nature. Unlike the monuments and buildings that it surrounds, the landscape was more prone to decay, and in the absence of maintenance, it soon turned into a forlorn wilderness. But whatever has survived, stands out as ample testimony of the perfection in landscape architecture that was attained by our forbearers. The Mughals were the builders of great monuments. About them it is said that they built their monuments like giants and finished like jewellers. The Mughals were also masters of landscape architecture. Babur, the founder of the Mughal rule in India, was also an ardent diarist. Whatever fascinated or tormented him, he put that in his autobiographical memoirs – Tuzuk-i Baburi. It is from his writings that we come to know of his deep love for nature – be it human, or flora and fauna. Before coming to India, Babur had briefly held the Timurid capital of Samarqand. The beauty of this city had tremendous impact in shaping his attitude towards architecture and, even more significantly, towards landscape. 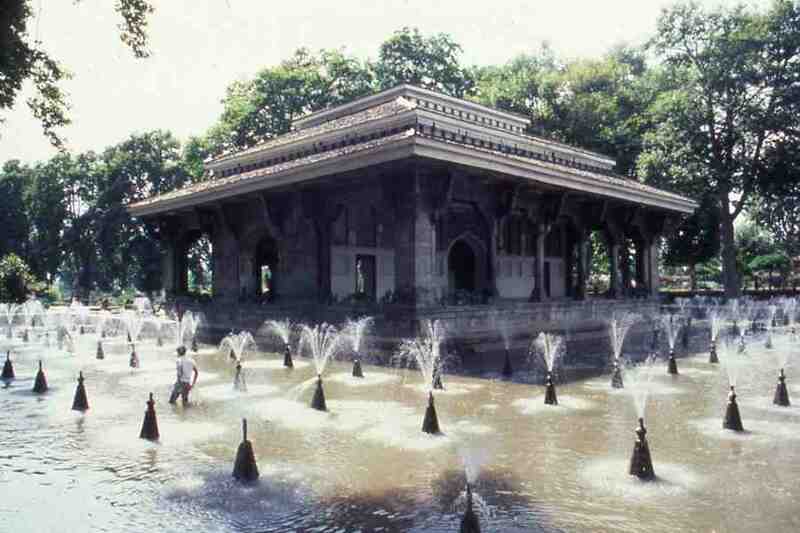 His creative genius in landscape architecture was first manifested at Kabul where he laid out as many as ten gardens. Laying of gardens was probably of greater significance for Babur. The manipulation of natural, untamed landscape into a rational, ordered creation was for him a metaphor for his ability to govern. Babur always preferred to camp in the gardens, rather than reside in any permanently constructed palace. When he came to India, the lack of good gardens was felt intensely by him, more so because of the heat and dust, that he seldom experienced in his home town. One of famous gardens that Babur created in India was located at Agra, which served as the capital of his Indian domains. Called by him Bagh-i Gul Afshan or the Flower Scattering Garden, this garden served as temporary burial site of Babur, till his body was carried to a garden in Kabul for permanent burial in accordance of his wishes. Now called Ram Bagh, Babur’s garden at Agra is only an effigy of its former self. One of the early examples of the Mughal landscape designing can be witnessed in its full glory at the Humayun’s tomb at Delhi. Completed in 1571, Humayun’s tomb stands in the centre of a patterned garden. The layout, known as Char-bagh, literally four gardens, has its origin in the Iranian traditions where such gardens symbolised the paradise. The tradition was further enriched by the Timurids in the North-Western provinces and subsequently the Mughals brought it to India. 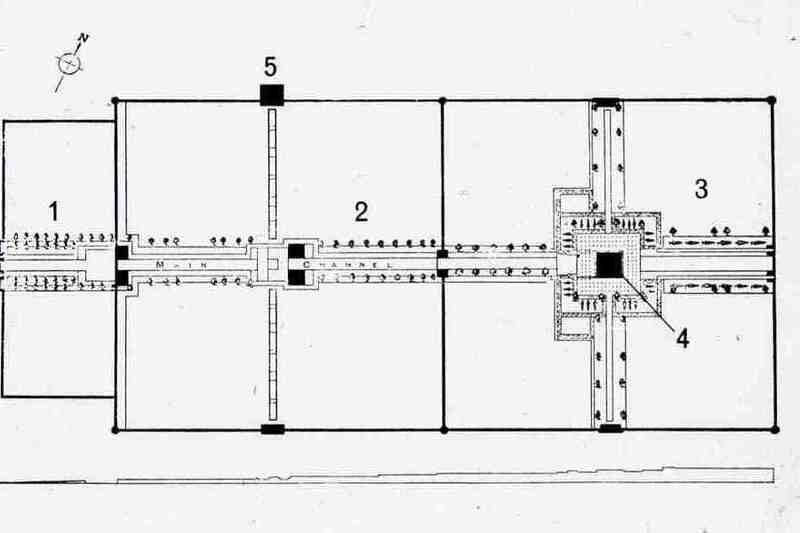 Situated within a walled enclosure, the main edifice is surrounded by a set of four square garden plots, one on each side, and another set of four garden plots of equal dimension at the corners. All these gardens are further divided into four smaller plots by narrow waterways. These water channels appear to vanish beneath the actual mausoleum and reappear on the opposite side. The running water for these gardens was supplied by constructing Persian Water Wheels, which were set up in conjunction with deep stepped wells called baolis. The impression these gardens created was stunning. The love for landscaping and laying out of beautiful gardens reached its zenith under Jahangir and his son Shah Jahan, both of whom were great lovers of Nature. Their love for natural beauty too them to Srinagar – the capital of the Kashmir province. The banks of Srinagar’s Dal Lake are famous for their Mughal gardens, the most famous of which is the Shalimar Bagh. Set against the backdrop of Pir Panjal mountain ranges, Shalimar was termed as the most beautiful of all the gardens by the French traveller Francois Bernier. The construction of Shalimar began in 1620 when Jahangir ordered prince Shah Jahan to construct a dam on the stream near the Dal Lake. After his accession to the throne, Shah Jahan further enlarged the garden, extending it to the foot of the mountains. A wide stream that runs through its length divides the entire garden laterally. It is intercepted by pavilions and terraced levels. The lower terraces were called Farah Bakhsh or the Bestower of Pleasure, and were used for imperial audiences. The higher terraces nearer the mountains were called Faiz Bakhsh or the Bestower of Plenty. These were intended for private use. On both the levels, pavilions or the summer-houses are placed in the midst of the canal. These are covered with tiered roofs and consist of a large room in the centre and four smaller apartments, one at each corner. These, in turn, are encircled by a verandah into which the four doors open – two looking up, or down, the canal and two leading to the bridges that connect these pavilions with both banks. Beautifully carved water chutes were constructed to enhance the force of cascading water of the stream. Pools with spouting fountains added magic to the charm of the garden. The beauty of the garden was enhanced during the night when the entire area was illuminated by the light of the oil lamps, that were placed in the recessed niches, specially carved for the purpose into the terraced walls over which the cascading water fell. The Shalimar garden epitomises the long-standing Mughal love of architectural setting within ordered Nature. This love of landscaping was rooted so deep by the Mughal enterprise that even the minor nobles of the empire, vied with their royal patrons to create the masterpieces of landscape architecture. One such noble was Nawab Fadai Khan, a great architect and foster brother of the Mughal emperor Aurangzeb, who designed the idyllic gardens as they stand today at Pinjore, near Chandigarh. Pinjore Garden is situated on a sloping site but unlike other Mughal gardens, the seven terraces at Pinjore, instead of ascending, descend into the distance and achieve an almost magical effect. In the near distance, the purple-green Himalayas seem to rise up sheer over the battlements of the old garden walls and the white buildings of the little hill station of Kasauli glow in the setting sun. Its graceful arched balconies and tinkling fountains, luxuriant green lawns and murmuring watercourse, limpid pools, shady walks and colorful flowerbeds, unusual descending terraces and monumental gateways-all were carefully planned to create a special effect. The central water channel has fountains and resting pavilions at change points. The watercourse with its never-ending bubbling music cascades from terrace to terrace, flows under the towering Rang Mahal, and then moves ahead playing around the Jal Mahal. in a large pool, which is now used as a restaurant. After Fadai Khan's departure from the scene and the end of Mughal rule, the pleasure garden he had so lovingly designed was overtaken by the wilderness. Nature ran untamed and unbridled until Maharaja Yadavindra Singh of Patiala restored Pinjore to its former glory, giving it a new name Yadavindra Gardens. In the mid-19th century, the sun finally set on the Mughals and a new political power – the British – loomed over the Indian horizon. Once firmly established, the British constructed their imperial capital – the New Delhi. The most important of the imperial buildings of this new capital was the Viceroy’s Palace, now known as the Rashtrapati Bhawan, the official residence of the first citizen of the Nation. Completed in 1929, this magnificent building recreated the charm of the landscaping by adding sprawling gardens laid over an area of 13 acres of land on the traditions of the Mughals. As a befitting tribute to their predecessors, the British named these gardens as Mughal Gardens. The Main Garden measures 200 meters by 175 meters. On the North and South it is flanked by Terrace Gardens and to its West is the Circular (Sunken or Butterfly) Garden which is approached through the Long Garden. The Main Garden is divided into a grid of squares by two channels running North to South and two running East to West. There are six lotus shaped fountains at the crossings of these channels. There are two big lawns, the central one is a square with each side being 45 meters, while the East lawn adjacent to the building, is oblong in shape and is about three fourth the size of Central lawn. There are two longitudinal strips of garden at a higher level on either side of the Main Garden forming the Northern and Southern boundary. At the centre of both these Terrace Gardens is a fountain, which falls inwards forming a well. On the Western tips are located two gazebos and on the Eastern tips two ornately designed sentry posts. Connecting the Main garden to its western wing is the Long Garden or the ‘Purdha’ Garden. It runs along on either side of the central pavement which goes to the circular garden. Enclosed in walls about 12 feet high this is predominantly a rose garden. There is a red sandstone pergola in the centre over the central pavement which is covered with Rose creepers, Petrea, Bougainvillea and Grape Vines. On the westernmost portion of the garden is situated the Circular (Sunken or Butterfly) Garden. A terraced bowl planted with fragrant varieties of flowers of all kinds tenderly leaning on to the circular enclosure. There is a bubble fountain concealed in a pool in the centre. Tended by over 418 gardeners, the Mughal Garden of the Rashtrapati Bhawan is a treat to the eyes and a rejuvenating tonic for the heart. Its enchanting beauty leaves the beholder spell-bound. Of most recent masterpieces of landscape architecture is the famous Rock Garden situated at Chandigarh – a union territory that also serves as the capital of the twin states of the Punjab and Haryana. The Rock Garden is the creation of Nek Chand – the untutored genius who worked with the local transport department. What began as pastime, soon developed into passion and then an obsession for Nek Chand. Built entirely of industrial waste and thrown-away items, it is perhaps the world's most poignant and salient statement of the possibility of finding beauty in the unexpected and accidental. It expresses the fragility of the environment, the need for conservation of the earth's natural resources, the importance of balancing industrial development and sound environmental practices. Now the Rock Garden is spread over twenty-five acres, housing several thousand sculptures set in large mosaic courtyards. Walls built of terracotta pots and sherds shade cobblestone paths, leading to large open areas occupied by pavilions built of concrete and stone. The buildings in the rock garden borrow from architectural precedents in India: some can be related to Mughal traditions by the use of the chattri or a domed kiosk supported on pillars; the curved Bangala roof whose two sides meet at a single ridge; and the pointed arch. Other structures pay homage to the simple elegance of village domestic architecture. Streams and waterfalls weave around these paths and buildings. Along the entire route, neglected and thrown-away items have been transformed into fanciful creatures placed on inclined fields of sherds and rock. All are constructed of various combinations of porcelain, concrete, and stone. People, dogs, bears, birds, elephants, mythological and hybrid creatures can be found. One figure, a three-dimensional mosaic of broken plates, reclines and holds a coffee cup. Some groups are organized by profession, such as dancers and musicians, while others are eclectic ensembles of personages and animals. Throughout, elements of Indian society become manifest. Groups of people exhibiting a great variety of dress, ranging from traditional Indian designs to western styles, reflect the multiplicity of ideas, attitudes and cultures within this country. The animal statues found in the Rock Garden reveal an appreciation and concern for the diverse wildlife found on the Indian subcontinent. The group of Indian women collecting water is especially relevant in a forum which addresses the need to protect the environment and to conserve resources. The Rock Garden is a monument of international importance, which expresses global problems through beauty, ingenuity, and imagination. The landscaping of surroundings has now become a permanent feature… It is an essential component of all the architectural creations whether private homes or public buildings, markets and malls, cultural centers, or the educational institutions. Everyone feels its effect, both on the present and future physical environment of human dwellings. Next week we will meet again with a new leaf from the enchanting saga of our built heritage, written by the sweat of the Master builders of our great nation. Until then, Namaskar and Jai Hind. Crowe, Sylvia and Haywood, Sheila, The Gardens of Mughal India, Delhi, 1973. Moynihan, Elizabeth B. Paradise as a Garden in Persia and Mughal India. New York, 1979. Singh, A.P. Concept of Environment in Ancient Art and Architecture, Delhi, 2003. Villiers-Stuart, Constance. Gardens of the Great Mogals. London, 1913. Wilber, Donald Newton. Persian Gardens and Garden Pavilions. Rutland, Vermont, 1962.